Or, perhaps another way you could look at it is that some folks are pretty click-happy during a software installation, and tend to leave things on the default settings. 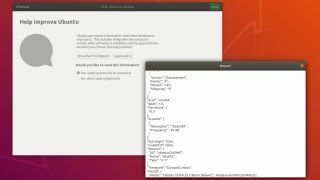 Although in fairness, the Ubuntu setup process does make it clear what’s going on, and allows you to look at a preview of the data that will be sent (which includes your PC spec, installed apps and approximate location). Still, the crucial point is that this data being piped back to Canonical is turned on by default, making it an opt-out decision. Although, rather oddly, as the Register observes, Canonical describes the ‘opt-in rate’ being 67% in its blog post analyzing the initial data collected, despite the fact that this is not an opt-in process. It certainly appears that a high percentage of users are consenting. Naturally, Canonical highlights the fact that this data is collected to help improve the OS, and to target the areas of the operating system which should be worked on (bearing in mind the typical hardware used). At any rate, what does the data itself reveal about Ubuntu users? Unsurprisingly, almost all Ubuntu Desktop users (the stats don’t involve the likes of Ubuntu Server or Ubuntu Core installs) run with a single CPU, and have 4GB or 8GB of system RAM – with the former just edging the latter. Interestingly, there’s a good chunk of folks still running with 2GB of memory (more than half those using 4GB – by the way, exact percentages aren’t given, just some charts showing relative usage). Most use a single graphics card, although a small minority have dual GPUs, and the vast majority of Ubuntu users have a single display. Most run at 1080p resolution, although there are almost as many on 1366 x 768. This is most likely because they are using Ubuntu on their notebooks. As for other details collected, Canonical notes that Ubuntu is pretty widespread in terms of its global distribution, and the average installation of the operating system takes 18 minutes. Interestingly, the new Minimum Install option is used by just over 15% of those who choose Ubuntu as their Linux distro. For the full rundown of statistics, complete with more bar charts than you can shake a rather lengthy bar at, you can head over to Canonical’s blog post.